This week resource managers, remote sensing managers, GIS and mapping specialists, inventory foresters and key technology suppliers from throughout New Zealand have been meeting in Rotorua. 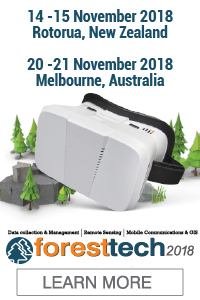 The event was the first in the well-attended two-part annual technology series, ForestTECH 2018. A raft of new data collection and inventory tools (including virtual, augmented and mixed reality being applied now in forestry applications) were unveiled, discussed and demonstrated to major forestry companies from across the region. The technology is evolving rapidly. Estimates are that by 2025 (just seven years from now), 66% of all front line and 8% of the total US workforce will be using virtual and augmented reality as part of their day-to-day jobs. Details from the event this week will follow. 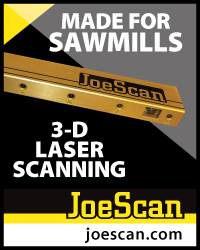 The tech series will be moving to Melbourne next week for Australian and a number of SE Asian forestry companies. In the technology space this week we’ve got a number of stories of interest. We’ve included one story with a series of video clips showcasing progress being made on the construction of a 265-foot, 18 storey tall wooden building in Norway. It’s aiming to become the tallest timber building in the world. In the second, a fleet of quadrotor drones, without needing to rely on GPS, has been recently tested in forested areas in the U.S. Fleets of autonomous drones speaking wirelessly, one to the other, according to the researchers involved, may well be the future answer to search and rescue deployment in densely forested areas. 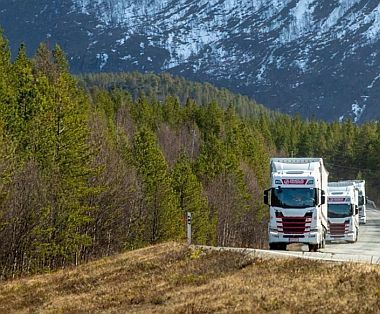 In wood transport and logistics, those attending this year’s WoodFlow 2018 series were provided an insight into the very latest trials that were being undertaken in Scandinavia and Asia on vehicle platooning. The first trial of its kind in truck platooning has just been completed in Canada. This time though it wasn't on a highway but in forests. Those involved are suggesting that it “signals the beginning of a transformation of the forest transportation industry on a scale not seen in decades”. Aside from improvements in productivity and cost savings, one of the other spin-offs is that the technology could go some way to addressing the chronic issue of a skilled-driver shortages that have plagued the wood transport industry for years. Details on the trials are contained in the story below. Finally, we cover news this week on the introduction of a new FSC national standard for Australia that joins Responsible Wood’s existing Australian Standard for sustainable forest management. To finish the week, we've included a feel-good story for you. This time it’s not a local initiative showcasing the industry to younger students (although it was great to see some 20 young foresters from the new initiative, Future Foresters, join with ForestTECH 2018 delegates in Rotorua on the evening of day one to network). Rather, it’s a simple but obviously well-built and sturdy Australian teapot. Believe it or not, it’s survived for around 80 years. It’s poured countless cuppas for FCNSW staff up in Coffs harbour. Over the years it’s also seen huge changes in forestry personnel and practices, as evidenced by the very early photo shown in the story. The teapot was used in Barcoongere State forest near Coffs Harbour way back in 1948. That’s it for this week. Enjoy this week’s read. Australia’s forestry industry is set to benefit from the launch of a second Australian certification standard for the sustainable management of the nation’s forests. Assistant Minister for Agriculture and Water Resources Richard Colbeck has welcomed the Forest Stewardship Council’s (FSC) National Forest Stewardship Standard, which joins the existing “Responsible Wood” certification standard in providing assurances that Australian wood products are from forests managed to the world’s highest standards. 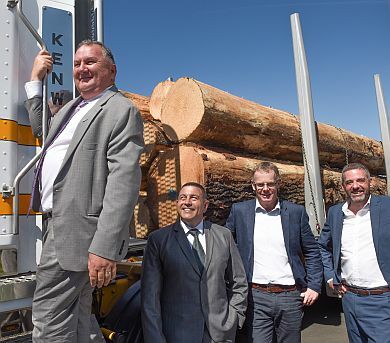 "Australia's forest and wood products sector is a great contributor to our nation—through the jobs and wealth the industry creates and its dedication to sustainable production,” Minister Colbeck said. “Global demand for timber products is projected to quadruple by 2050 and the new Australian FSC Standard will help us tap into this growth market by utilizing a globally recognised trust mark for sustainable forest management. “Certification continues to be an important part of the Australian forestry sector and demonstrates the strong sustainability credentials of our well-managed forest industries. Consumers are increasingly aware of, and interested in, the origins of the products they buy and the processes that go into making them. Both nationally and internationally, certification has developed as a way of providing assurance to consumers that the wood products they are purchasing are from sustainably managed forests”. 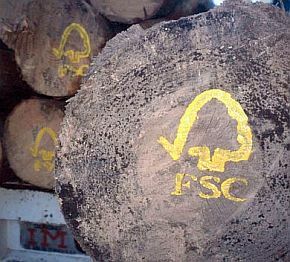 “The new FSC national standard was jointly agreed by industry, environment and community interests. Australia now has national standards aligned to the two global certification systems, PEFC and FSC, which have been specifically tailored to Australia’s unique conditions and high-quality regulatory framework. “The Australian Government contributed AU$900,000 to the development of both the new FSC standard and the Responsible Wood standard and is fully committed to sustainable management of Australia’s forests. Consumers and producers can read the ‘National Forest Stewardship Standard for Australia’ here. FPInnovations and its partners took truck platooning research a giant step further and earned a spot in history by successfully road testing the emerging technology in the deep forests of Quebec in the first trial of its kind in Canada. The day-long trial in late October took place in Rivière-aux-Rats, Quebec and signals the beginning of a transformation of the forest transportation industry on a scale not seen in decades. It could also solve the chronic issue of a skilled-driver shortage that’s plagued the industry for years and shows no signs of abating. The tests involved two platooned trucks hauling logging trailers on resource roads between a Resolute Forest Products saw mill and the company’s logging site 75 km away. Drivers were at the wheels of the trucks but in the future, only the lead truck will have a driver and the following trucks will be fully automated. 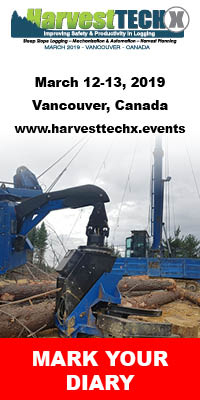 The trial is part of a joint research project in collaboration with Transport Canada, Alabama’s Auburn University, and Resolute Forest Products. At the same time, platooning was also successfully tested by FPInnovations’ PIT Group, Transport Canada, and Auburn University on public highways in Quebec. The platooning technology was developed by Auburn University’s department of mechanical engineering. Truck platooning is an emerging vehicle technology in which trucks are linked by a computer system that maintains the desired distance between trucks, as well as controls acceleration and braking, reacting faster than a driver typically can. Platooning uses a dedicated short-range radio communications (DSRC) protocol approved for communications at high-speeds, as well as a GPS system, and radar technology. Highway platooning is already legal in several U.S. states, including Tennessee and Georgia. However, platooning is only in the testing phase in Canada. Gough Cat has announced this week an agreement with United States company Weiler Incorporated to distribute its forestry product line in New Zealand. Founded in 2000, Weiler has a long history of successfully manufacturing equipment distributed through the global Cat dealer network, says Gough Cat Executive General Manager Chris Heaton. Gough Cat will distribute and service Weiler forestry products, including wheel skidders and track feller bunchers, while continuing to provide and service Cat’s forestry 500 series purpose-built forestry machines designed for log loading, harvesting and other New Zealand forestry applications. 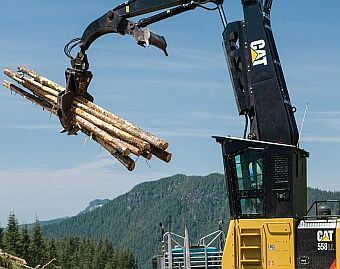 This new agreement follows Caterpillar Inc’s announcement in August that it had entered into a preliminary agreement to sell some of its forestry business to Weiler. Weiler paving and drill products will be available in New Zealand later this year, with forestry products becoming available early in 2019, as Caterpillar transitions these forest products. About 400,000 seedlings bought by the New Zealand government to plant in Northland have gone to waste after the land was too wild to plant on. Forestry Minister Shane Jones said the cost to the taxpayer was about NZ$160,000. A deal was done between the Crown and the Ngati Hine Forestry Trust in the Far North earlier this year and 1.2 million seedlings were bought to be planted. Mr Jones said only 200,000 seedlings were successfully planted because the land wasn't up to scratch. "Well the land is untamed land, it's wild, and obviously the analysis that was done on the ground was a lot more ambitious in terms of what could be delivered upon,'' he said. About 600,000 of the seedlings were re-distributed to other forestry ventures - many of which are with iwi and have existed for many years. Mr Jones said he'd been clear with officials involved in the botch-up that it's not good enough. Mr Jones said part of the problem was the government was elected in October and planting started four or five months later and "perhaps those targets were too ambitious''. In August Mr Jones announced Cabinet had approved the creation of a new grants programme and partnership fund to get more trees in the ground and provide training and employment opportunities. The Provincial Growth Fund, which Mr Jones is the minister in charge of, is allocating $240m to support tree planting in areas where "wider social, environmental, and regional development goals can be achieved''. Documents released by Treasury reveal they were highly critical of the grants and fund and said as much in a briefing paper to the Finance Minister Grant Robertson. Officials said there was "little detail" that came with the Budget bid and they didn't support Cabinet approving it. Mr Jones said Treasury gave some "predictable cautionary remarks", which he's taken into account. The details had been worked through since that briefing paper and he said he's confident Treasury's concerns have been covered off. The greater details of the partnership fund and grants programme will be released later this month. The second Science New Zealand awards, held on 9 November at Parliament Buildings, brought together highly talented scientists from all seven Crown research institutes, including Scion. Awards were presented in three categories to awardees from each institute. Acknowledged for his 40 years in science, Dr Ian Suckling was the Scion recipient of the Individual/Lifetime Achievement Award. Ian began his career at the then Forest Research Institute as a scientist in the Wood Chemistry Group and progressed to leadership roles in areas covering fibre cement pulp, fibre optimisation and biofibre products. In 2010-2012 Ian represented New Zealand in the international bioenergy sector, specifically on commercialising liquid biofuels from biomass. During 2013-14 he led a NZ$13.5 million programme co-funded by the MPI Primary Growth Partnership, Norske Skog Tasman and Z Energy, with Scion providing research and technology support. Over the last two years, Ian has led the ‘New Zealand Biofuels Roadmap’ project. Andrea Stocchero received the Emerging Scientist or Engineering Award for Scion, in recognition of his significant contribution to the timber, building and design industries. As Scion’s only sustainable architect, Andrea’s research focus is to achieve high sustainability targets through the use of wood and other biobased materials. Last year, Andrea was invited to speak at the UN Food and Agriculture Organisation representing New Zealand and the international timber design and construction sector, and in February this year he presented at a follow-up meeting in Rome. Andrea is also part of the Toitu te Kāinga, Toitu te Ora, Toitu te Tangata (Sustainable Homes, Healthy People) project led by Toi Ohomai Institute of Technology for the Te Whaiti community and recently he worked with Kai Rotorua on living building requirements to benefit the region with regard to healthy eating and health. The Science Impact Award for Scion was presented to the Ligate™ Team represented by Dr Warren Grigsby and Armin Thumm. The bioadhesives team, comprising chemists, polymer scientists, technologists and commercial managers, developed a globally recognised new technology that has been described as a “game changer for wood panel manufacturers”. Scion’s Ligate™ bioadhesives are free of petrochemicals and formaldehyde, and made from 100% renewable plant resources including lignin, a by-product of papermaking. These water-based, non-toxic bioadhesives are compatible with existing adhesive and panel board manufacturing equipment. Unlike other biobased adhesives, the resin does not just replace petrochemical adhesives, it uses bio-inspired chemistry to achieve its performance. 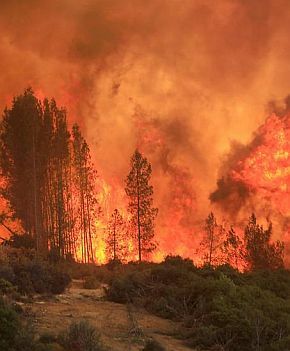 Two monster wildfires in California, including the most destructive in state history, have been burning out of control destroying scores of buildings and forcing hundreds of thousands to flee their homes. The number of people killed in the wildfires had risen to 50 – mid-week including 48 from Northern California's Camp Fire, already the most destructive and deadly blaze in state history. In Paradise, which had about 27,000 residents, the fire destroyed most homes and half the businesses, the town's mayor Jody Jones said on CNN, describing a long period of recovery ahead. President Donald Trump, weighing in on the emergency during a trip to France, said that "gross mismanagement of forests" was to blame. "There is no reason for these massive, deadly and costly forest fires in California except that forest management is so poor," he wrote in a Twitter post. "Billions of dollars are given each year, with so many lives lost, all because of gross mismanagement of the forests. Remedy now, or no more Fed payments!" he added. Trump, a Republican, has previously blamed California officials for fires and threatened to withhold funding, saying the state should do more to remove rotten trees and other debris that fuel blazes. Officials in the state have countered that climate change is the main culprit and have pointed out that many of the burn areas have been in federally-managed lands. "Our focus is on the Californians impacted by these fires and the first responders and firefighters working around the clock to save lives and property — not on the President's inane and uninformed tweets," Evan Westrub, a spokesman for California Governor Jerry Brown said in an email. Further comment and reaction can be read here and here. Some new videos show progress on Mjøstårnet, a project that aims to become the tallest timber building in the world. Over the past few years, timber has become a more widely used material in tall buildings–and from Canada to Japan, architects are pushing the material further and further into the sky. Mjøstårnet, an 18-story project being built in Brumunddal, about 90 minutes north of Oslo, is the latest all-wood high-rise to compete for the record of world’s tallest. In a five-part micro-documentary produced by Moelven, the Scandinavian construction company behind the project, we get a glimpse at the building project. All five videos can be viewed using the link below. At 265 feet tall, the structure is a fascinating piece of engineering for its anti-fire features alone. Up until 1997, Norway had legally prohibited large timber buildings over three stories after a terrible fire consumed the city of Ålesund in the early 1900s. Yet the construction company claims its building is one of the safest in Norway, thanks to the use of glulam–or glued laminated timber. More >>. NZ$7.6 million will be spent on 5079 hectares of erosion-prone land across 64 properties in the Gisborne district. A record number of applications for funding from the Erosion Control Funding Programme have been approved by Te Uru Rakau (Forestry New Zealand). 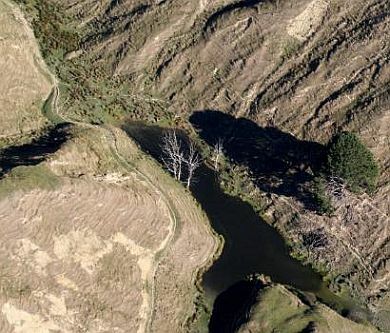 This will see more than NZ$7.6 million spent on 5079 hectares of erosion-prone land across 64 properties in the Gisborne district and is closely linked to the implementation of the One Billion Trees programme. “Our partner in managing the programme, Gisborne District Council, has worked hard with landowners to facilitate applications for land that needed this work. This has resulted in almost three times the usual number of applications,” said Steve Penno, director of investment programmes, Ministry for Primary Industries. “The council has put resource in and has done a great job ensuring the work continued to secure these projects, while also dealing with urgent pressures following the severe weather events.” This year’s funding round opened in May and was extended until mid-July, following the Queen’s Birthday storms that caused damage in affected areas, especially Tolaga Bay. A small number of the total applications were approved with conditions, where the land is classified as red-zoned or very high risk under the National Environmental Standards for Plantation Forestry. These will be subject to resource consents to ensure the surrounding environment is protected. The Te Uru Rakau assessment process for applications includes GIS (geographic information system) mapping and assessment of land eligibility and technical forestry assessment. A specialist assessment panel reviews each application to ensure the proposed treatment is suitable for the site and can be practically managed into the future. The Erosion Control Funding Programme was established in 1992 to achieve sustainable land management of the worst eroding land in the Gisborne District. Many of us will have watched TV or movie dramas where a bunch of luckless travellers get totally lost in a dense forest. They hear the unmistakable sound of a helicopter nearby and start waving frantically. Most often, the rescuers will fail to see them and the life-threatening adventure starts anew. Being unable to spot hikers under a thick canopy is a very real problem though, but fleets of autonomous drones might offer some hope. Researchers from MIT and NASA's Langley Research Centre have been modifying quadrotor drones to allow a fleet to work together to zip through the trees of a thick forest without the need for GPS navigation, talking to each other wirelessly as they fly. Each drone is equipped with LiDAR to create detailed maps of the area. Noting that individual trees are much of a muchness to drones using this system, the researchers instructed the fleet to look for clusters of trees and register unique patterns, and then tap into algorithms to determine if an area has already been searched or is yet to be searched. Onboard path-planning software tells each drone to head for yet-to-be-searched areas. The mapping information from each drone can be stitched together using simultaneous localization and mapping software at a ground station for monitoring by human search teams. In this three-dimensional map, the trees are represented by blue and green blocks and unexplored zones are at first dark, but turn grey as they're being mapped. Numerous drones were put through their paces in both forest simulations and within a wooded area at the Langley Research Centre. Though they lacked object detection technology that would allow them to identify lost hikers, this could be added to the system for real-world applications, meaning that a drone could mark the collaborative map with the location of missing individuals so that human rescuers could make their way on foot and save the day. More >>. A new NASA laser instrument set to launch to the International Space Station in December will help scientists create the first three-dimensional map of the world's temperate and tropical forests. The Global Ecosystem Dynamics Investigation, or GEDI, is scheduled to launch on SpaceX's Falcon 9 rocket. From the station, GEDI's advanced laser technology will reveal the three-dimensional structure of forest ecosystems around the globe. GEDI pronounced "Jedi," will soar over both the dark side and the light side of Earth at 17,150 miles per hour. Measurements of the height of foliage, branches, trees and shrubs below its path will yield new insights into how forests are storing or releasing carbon. "We'd like to be able to understand what the role of forests are," said Principal Investigator Ralph Dubayah of the University of Maryland, College Park. "We want to know how much carbon is being stored in trees because if we cut those trees down, that's a potential source of carbon dioxide in the atmosphere." The GEDI mission is designed to help researchers locate those sources and stores of carbon. Scientists know how much carbon is going into the atmosphere, but are much less certain about where and in what quantities carbon is being absorbed, explained Laura Duncanson, a research assistant professor at the University of Maryland, College Park. Earth's oceans and forests take up atmospheric carbon, but scientists want to investigate which forests are taking in the most, or if those forests will continue to do so through time. GEDI will help unravel this mystery by providing the first highly detailed forest carbon stock map, pinpointing in fine detail where the Earth's most carbon-rich forests are. "To effectively manage forests toward mitigating climate change, we need to know how much carbon they store and how that's distributed spatially, and that's what GEDI will give us," Duncanson said. "We can't know how much carbon is released to the atmosphere through deforestation and forest degradation until we know how much is already there; GEDI will collect new data and fill this big, critical carbon knowledge gap." GEDI floods a dense canopy with laser light pulses that bounce back after making contact with an object. The end result is a comprehensive view of the density all the way down to the ground, Blair explained. The biggest challenge is having enough laser power and sensitivity to see through tropical forests, which is something GEDI does well. The instrument can work well even in the world's densest forests, where less than 1 percent of the light that shines down makes it all the way to the ground. In addition to forest structure, GEDI will measure patterns of different environments within tropical and temperate forests. Limited data from field plots and airborne and space-based lidar have given scientists an idea of how habitat structure varies at specific locations, but GEDI's advanced technology will fill in the missing pieces of information around the Earth, said Scott Goetz, deputy principal investigator and professor at Northern Arizona University. "We'll be able to inform models of biodiversity, including patterns of species richness and specific habitat requirements of threatened and endangered species." Goetz said. "If we're better able to map where those habitats are using GEDI canopy structure data combined with other satellite data, it will help with the conservation of those species and forests harbouring high biodiversity." GEDI is slated to begin its two-year science mission aboard the station by the end of 2018. The GEDI Science Team expects to process incoming information and make it available to the public within six months of launch. The US$94 million mission was competitively selected as a NASA Earth Venture-Instrument mission in 2014. 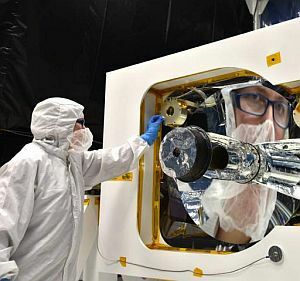 Led by the University of Maryland in collaboration with Goddard, GEDI has the highest resolution and densest sampling of any lidar every put in orbit. The recent opening of the new Coffs Harbour Forestry Corporation office marks a period of change and evolution for the organisation. In use at the event was a historic teapot that can trace its roots back over nearly 80 years in the organisation. Since the first tea at the official opening of the former Jetty office in 1941, it has poured countless ‘cuppas’ and followed radical changes in forestry and Coffs Harbour itself. The teapot is in many ways symbolic of the organisation’s culture, reflected Forestry Corporation CEO, Nick Roberts. “Artefacts like the pot are very visual reminders that forestry has a long local history in Coffs Harbour and is deeply embedded in the community,” said Mr Roberts. “Our old Jetty office was the first three-story building in Coffs Harbour and our organisation has grown and evolved in tandem with the city. Over the time our staff have cared for the teapot, we have seen great advances in forestry technology and science to sustainably provide timber for our community. While the organisation has a healthy respect for tradition, Mr Roberts is also proud of the change seen in its workforce since last office opening 80 years ago. “Looking at the photos of the Jetty office opening in 1941, it is apparent that we have much more diversity in our staff now,” he said. “We have more women in the workforce and a much wider range of staff backgrounds — this serves us greatly”. 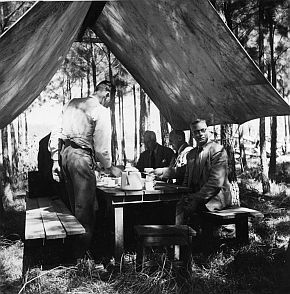 Photo: The teapot in use in Barcoongere State forest near Coffs Harbour while entertaining Lord Robinson, Chair of the British Forestry Commission in 1948. The Provincial Growth Fund (PGF) will provide a loan of up to NZ$1.8 million to TaranakiPine to allow the company to diversify and create new jobs, New Zealand’s Regional Economic Development Minister Shane Jones announced this week. TaranakiPine is in the early stages of producing factory finished engineered timber panels, which can be used in the construction of floors and roofs in buildings. With support from the PGF, the company will now be able to accelerate the project from pilot stages to full commercialisation. “This will generate seven new jobs directly and 13 new jobs indirectly and is an exciting investment that supports a locally-based business to fast-track new product to market, which will in turn help to unlock new economic opportunities in Taranaki”. China Forestry Group NZ (CFGNZ) is once again backing local wood processing with a ground-breaking agreement on harvesting and processing wood from Taranaki’s largest forest. China Forestry Group NZ and Taranakipine sawmill in New Plymouth signed a supply agreement yesterday that supports long term wood processing in New Plymouth and employment for the 170 workers at Taranakipine. The agreement will see China Forestry Group NZ supply minimum monthly volumes to Taranakipine over the long term and at agreed pricing. Te Wera forest is very steep in parts, requiring specialist equipment and personnel. So, to help with harvesting, China Forestry Group NZ negotiated an agreement with Northland harvesting company Stokes Logging to relocate part of their crew capacity and business to Te Wera. “The partnerships with Taranakipine and Stokes Logging are a material demonstration of China Forestry Group NZ’s ongoing commitment to New Zealand and how forestry owners and local processors can better work together,” says Steve Walker, Chief Operations Officer of China Forestry Group NZ. 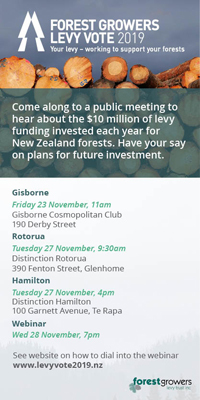 China Forestry Group NZ will underwrite the cost of Stokes Logging relocating with a take-or-pay commitment to 100,000 tonnes per year for seven years, to December 2026. This commitment will see a number of families move to Taranaki with their moving costs covered by China Forestry Group NZ. “These agreements are based on mutually beneficial commercial outcomes. At the same time, we appreciate that we have an important role to play in the New Zealand forestry industry as a supportive and understanding partner to local operators and as kaitiaki of the natural and cultural resources entrusted to us,” Steve Walker says. When choosing materials to make something, trade-offs need to be made between a host of properties, such as thickness, stiffness and weight. Depending on the application in question, finding just the right balance is the difference between success and failure. Now, a team of Penn Engineers has demonstrated a new material they call “nanocardboard,” an ultrathin equivalent of corrugated paper cardboard. A square centimetre of nanocardboard weighs less than a thousandth of a gram and can spring back into shape after being bent in half. Nanocardboard is made out of an aluminum oxide film with a thickness of tens of nanometers, forming a hollow plate with a height of tens of microns. Its sandwich structure, similar to that of corrugated cardboard, makes it more than ten thousand times as stiff as a solid plate of the same mass. Nanocardboard’s stiffness-to-weight ratio makes it ideal for aerospace and microrobotic applications, where every gram counts. In addition to unprecedented mechanical properties, nanocardboard is a supreme thermal insulator, as it mostly consists of empty space. The results of their research can be found in the journal Nature Communications. His father said he'd make a deal with his son, "You bring your grades up from a C to a B average, study your Bible a little and get your hair cut. Then we'll talk about the car." The boy thought about that for a moment, decided he'd settle for the offer and they agreed on it. The boy said, “You know, Dad, I've been thinking about that, and I've noticed in my studies of the Bible that Samson had long hair, John the Baptist had long hair, Moses had long hair, and there's even strong evidence that Jesus had long hair." "Did you also notice that they all walked everywhere they went? OK, a couple more for you. Will glass coffins become popular? Remains to be seen. An elderly, but hardy cattleman from Texas once told a young female neighbour that if she wanted to live a long life, the secret was to sprinkle a pinch of gunpowder on her oatmeal each morning. She did this religiously and lived to the age of 103. She left behind 14 children, 30 grandchildren, 21 great-grandchildren, five great-great-grandchildren and a 40 foot hole where the crematorium used to be.